The jumbo index cards series is dedicated to serious game card lovers. You can tailor your special message and have it printed at the card front. We offer smooth finish and optional linen finish cards. Smooth finish uses a 300 gsm card stock with blue core and is popular for promotional use. 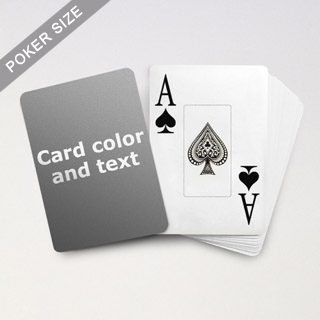 Linen finish uses a 310 gsm French card stock with black core and is preferred by casinos and game parlors because of its supreme durability and mark resistant quality.